Two Leeds College of Building apprentices have just returned from the trip of a lifetime after winning a competition to go on an all-expenses-paid journey to northern Spain for three days. 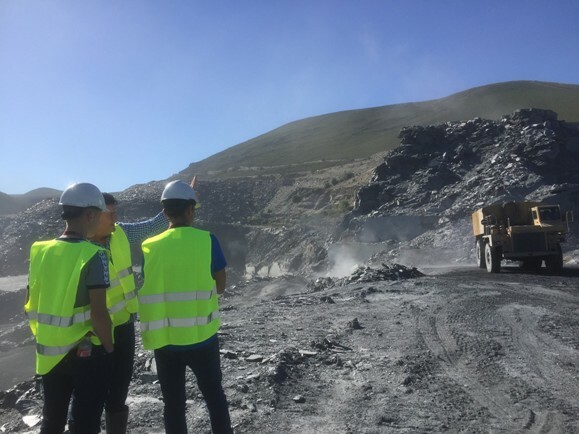 The students flew to Madrid and then on to the famous CUPA PIZARRAS quarries – the biggest tectonic natural slate reserves in the world – to see first-hand where slate is excavated and manufactured for international distribution. Daniel Williams, 18, who works for St Leger Homes in Doncaster, and Jacob Brain, 19, who works for WDH in Wakefield, were selected for their exceptional standard of work and commitment to their training over the last academic year. The competition is sponsored by longstanding partner, CUPA PIZARRAS, who support the College and donate roofing supplies (including its natural slate range) through Burton Roofing Merchants Ltd. Accompanied by roofing lecturers Chris Messenger and Tim Donegan, the students saw for themselves the production of slate on a massive scale at CUPA’s world-leading quarries. The students observed how stone is extracted from the ground, selected, and hand-split ready for transport to roofing markets around the world. The pair visited the on-site showroom, toured the immense quarry site, watched demonstrations, and tried out some of the difficult techniques themselves.